ACS:LAW’s Greedy friends have lost their minds! | Received a letter from Goldeneye International? MICM(Mircom? TCYK LLC? ACS:LAW’s Greedy friends have lost their minds! I actually watched Hurt Locker and was soooo dissapointed that I asked for my ticket money back for “failure to provide the services promised” I know I am in a small minority according to IMBD it was a “Good Film” I could not agree less. When I read this post I felt somewhat vindicated and certainly will not be watching anymore of their crap in the future. As far as I was concerned I was swindled out of the money I paid to watch it and was NOT reimbursed as I would have been for any other service or product that had not lived up to my expectations. This just bolsters my opinion that these lawyers are simply looking at ways of recouping money through LACK of sales, NOT because they have been downloaded but simply because they are CRAP and substandard. Dunlap Weaver and Grubb AKA “US Copyright Group” and also the self-righteous “Save Cinema.org!” Of course these people have NO interest in actually STOPPING downloading at all, they are “Money Grubbers”. The split is roughly 70% to the Lawyers and 30% to the “Copyright holding company” you can imagine the pittance that the actual “Creative people” get from that. 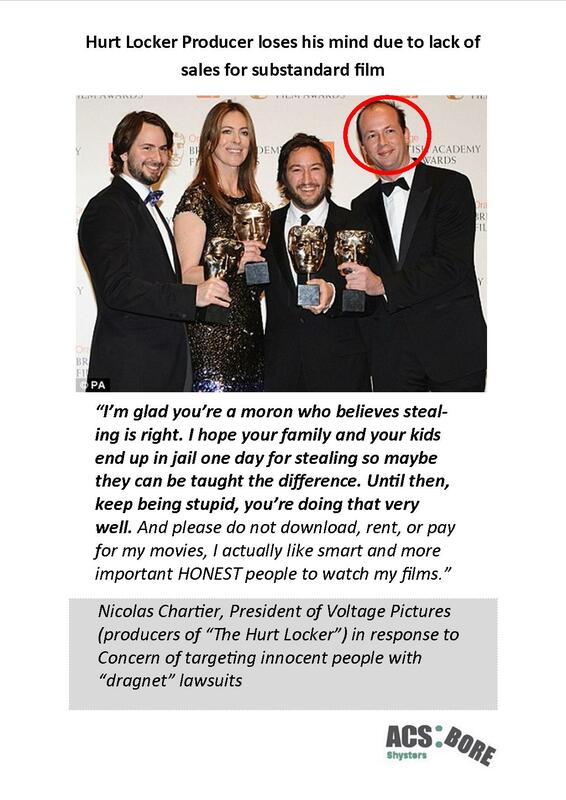 But I digress, in a sense “Hurt Locker” seems an exception to the usual bunch of crap that is represented. For Example Uwe Boll is considered the new “Ed Wood” a Director SO inept that most of his films feature at the VERY bottom of ANY thinking person. Dont believe me? see here. There are others but you get the point, these are REALLY awful films, the type people would not download if someone paid them! Remember this group is the VERY group that Andrew Crossley of ACS:LAW has been crowing about being in partnership with. This entry was posted in Uncategorized and tagged acs law, andrew crossley, copyright, file sharing, films, hurt locker, letters, Nicolas Chartier, scam, us copyright group, voltage. Bookmark the permalink. 3 Responses to ACS:LAW’s Greedy friends have lost their minds! Incredible! This blog looks just like my oold one! without pricey advertising and marketing expenses. enhancement of the upper buttock region.